Having had a successful turnout for our Library Inductions this year, which were kept to a more pared-down approach than previous years, we have been enjoying the livelier atmosphere which always descends on the Oriental Institute once Term proper has begun. It has been great to see many familiar faces back again for another year, and to welcome our new intake. We hope that everyone is having a good term so far and urge anyone who needs help to please let us know. There will be someone at the library desk at all times during opening hours, and if we are not immediately visible we will be somewhere close by! Readers may have noticed a display of Georgian books from the Wardrop Collection which have been placed just inside the door for the last few weeks. These were to accompany a talk about Georgian Manuscripts which took place last month. We will be featuring other displays of materials from the Oriental Collections over the next few months; Lydia is currently finalising the next one and we will post details on the Facebook Page soon! The new version of PCAS has been for the most part running well since it went live in September, however, we are aware of particular problems for which the team are seeking support from the suppliers, in particular the fact that printing from pdf.s does not appear to work very well. There are also occasional problems with scanning and printing, as well as a known issue with reducing or enlarging copies, all of which are being looked into and which we hope will be sorted out or at least included in documentation soon. In the meantime we would ask readers to let staff know when they do encounter problems and to contact pcas@bodleian.ox.ac.uk to let the support team know as well. The more people report things, the more we can get them fixed! Since the start of Term we have noticed a number of readers with drinks in the library; may we please remind everyone again that ONLY water in sealable bottles is permitted? This is to protect the books and furniture from accidental spillages which may cause damage and encourage vermin. We have spoken to individuals when we have seen them with drinks other than water but would appreciate everybody’s cooperation. This entry was posted in Minor Collections, News, South Asian Collection on 2 November 2016 by katieguest. As usual, once the vacation gets into full-swing, we have been busy in the library. Firstly, in collaboration with Professor Sebastian Brock, we have now moved books on Syriac and Armenian subjects which were housed in the Library of Congress section into a new Eastern Christianity Library (ECL) collection in the basement, round the back of the staircase where the Minor Collections materials are still kept. 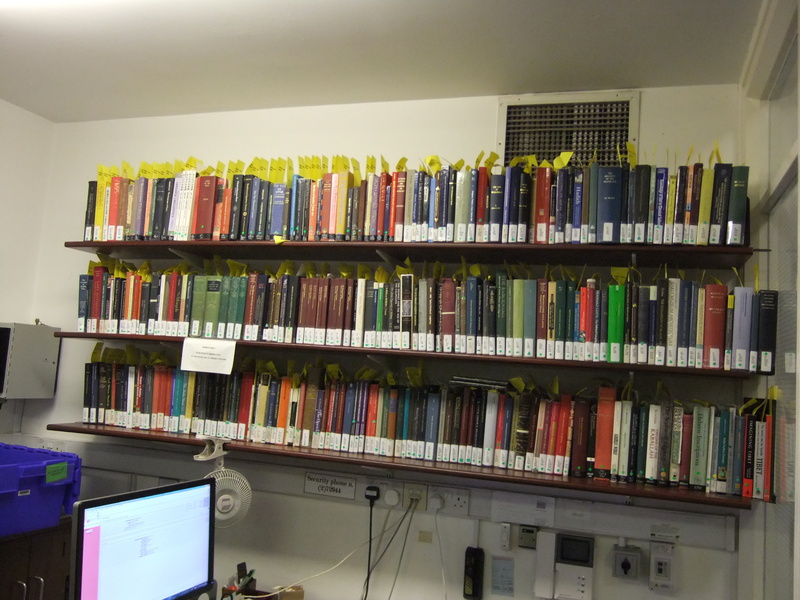 The labels are slightly different – they now have a prefix [ECL] – but otherwise those books which could be borrowed before still will be. If you have problems finding anything do ask the library staff. Secondly, as part of the ongoing reclassification into Library of Congress of the general collection on the ground floor, the Short Loan “Apply Staff” books which are held in the front office have now been reclassified. This will mean that items which were once in a particular place on a shelf will have moved, but please rest assured that we have not removed anything from the shelf (with the exception of a box containing three audio cassettes which nobody remembered being there in the first place). We think they look much better with their smart new labels! Please check SOLO for updated shelf marks for the Short Loan collection. Over the next few weeks staff from OIL will be undertaking more reclassification work, this time for the Oriental materials which are going into the Weston Library. We will post more about this later in the summer. Finally, on Tuesday 29th July we said a fond goodbye to Andrew Blades, who has been covering Friday afternoons and Saturdays at OIL since 2010, and who worked in various other parts of the Bodleian for a number of years before joining us. Andrew is leaving for an exciting teaching post at the University of Bristol, and we wish him all the best and thank him for his dedicated service. The Library will be open as normal over the next month, apart from the August Bank Holiday – we will be CLOSED on Saturday 23rd and Monday 25th. There will be further closures in September for St Giles’ Fair, but we will remind everyone of that nearer the time. Notices will be posted accordingly. This entry was posted in Eastern Christianity Library, Library of Congress Collection, Minor Collections, News, People on 1 August 2014 by . At 4pm this Friday, 25th May 2o12, our lectures on the history of Georgia in Shakespearian times by Giorgi Akhvlediani continue! The dramatic lives of two Royal families, rulers of the partitioned Georgian kingdoms of Kartli and Kakheti include all the elements of a tragic drama. Having become the battlefield of two great empires long ago, the Georgian kingdoms applied their traditional policy of balancing between war and peace, satisfying both Ottoman and Persian interests. The Kakhetian king Alexandre was successful in this policy for two decades by accepting Ottoman suzerainty. But the policy came under increasing tension as each time the Ottoman-Persian wars would have a different outcome. Fate lured king Alexandre and three of his sons into a bloody family conflict followed by Persian intervention, which turned the rich and peaceful small kingdom into a dead land with two thirds of population killed or deported. As opposed to the Kakhetian kingdom, Kartli was at war and largely survived owing to the personal bravery of king Luarsab and his elder son Simon “the Mad” who replaced his father after Luarsab’s strange death foreshadowed by his own dream. A number of great historical characters, the morals and manners of the century placed in an extraordinary political situation, all mixed up with destiny and meanness make the picture of The Times of the Blood Rains unforgettable for its spirit and the tragic reality of survival. Giorgi Akhvlediani (also known as Aka Morchiladze) is the bestselling Georgian novelist with a background in history. Some of his novels, which include the Travel to Karabakh, The Others, the Madatov Trilogy, Santa Esperanza, Maid in Tiflis and Mamluk earned him the name of the most widely-read and celebrated Georgian author alive. Currently he resides and writes in London. In three lectures he will be presenting probably the most dramatic and tragic century of Georgian history. Venue: Faculty Room (3d floor), Oriental Institute, Pusey Lane OX1 2LE, Oxford. This entry was posted in Minor Collections on 22 May 2012 by . Lecture Room 1, Oriental Institute, Thursday, 17 May, 16:00. Venue: Lecture Room 1, Oriental Institute, Pusey Lane OX1 2LE, Oxford. This entry was posted in Minor Collections on 16 May 2012 by . Bate midrashot : esrim va-hamishah midreshe HazaL al pi kitve yad mi-genizat Yerushalayim u-Mitsrayim, Mahad 5. im hosafot mi-kitve yad, miluim ve-tikunimme-et Avraham Yosef Verthaimer. Najm-i Kubra pir-i valitarash, Chap-i 1. The Nabati poetry of the United Arab Emirates : selected poems annotated and translated into English, 1st ed. PK6239.5.E5 R34 RAF 2010 Ref. Colloquial Persian : the complete course for beginners, 3rd ed. PL234.A3629 C67 AKI 2010 Ref. Corap kacigi : siir, 1. baski. PL234.K874 U58 KUT 2010 Ref. Unutulmus kent : siirler, 1. baski. PL248.A3289 K37 AKA 2010 Ref. Kara Fatma : kurtulus savasi’nin Ilk Turk kadin subayi fatma seher’in kahramanlik oykusu, 1. basim. PL248.A77 V37 ARS 2010 Ref. Varlik damitan : roman, 1. baski. PL248.A9376 S26 AYD 2010 Ref. Sam’da bir mardinli, 1. basim. PL248.B348 H37 BAR 2010 Ref. PL248.B4839 K37 BIC 2010 Ref. PL248.D3358 Y56 DAV 2010 Ref. Yine de guzel sey yasamak, 1. baski. PL248.E6878 Z68 AKB 2010 Ref. Siir adimli bir yolcu Haydar Ergulen, Ege basim. PL248.F345 O111 FER 2010 Ref. O yaz… : oyku, 1. bs. PL248.K2596 H67 KAR 2010 Ref. PL248.K5955 D56 KIZ 2010 Ref. PL248.K765 F48 KUC 2010 Ref. PL248.S3465 K37 SAV 2010 Ref. PL248.S593 S26 SIY 2010 Ref. Sanri ve gercek : roman, 1. baski. PL248.T65 I45 TOY 2010 Ref. Ilk kirilma : kirilmalara agit, 1. baski. PL248.U246 D86 UCA 2010 Ref. Dunyayi seyretmek icin bir yer : oyku, 1. baski. PL248.Y373 B84 YAS 2010 Ref. Bugunlerde bahar indi, 1. baski. PQ3989.2.D57 Z45 HID 2006 Ref. This entry was posted in Islamic Collection, Jewish Studies Collection, Minor Collections, New Accessions on 4 May 2011 by . Muhammad : a prophet for our time, 1st ed. Islam : the straight path, Rev. 3rd ed., updated with new epilogue. Religion on the rise : Islam in the third millennium, 1st ed. Jacob of Sarug’s Homilies on Elijah, 1st Gorgias Press ed. Japheth ben Ali, ha-Levi, 10th cent. Old Jewish commentaries on the Song of Songs I : the commentary of Yefet ben Eli, 1st ed. The witness of the Oriental Orthodox churches : recovery, rediscovery, renewal, 2d ed. Jacob of Sarug’s Homily on the partaking of the Holy Mysteries, 1st Gorgias Press ed. PJ7816.A678 M8613 BAR 2008 Ref. al-Sirah al-dhatiyah fi al-Mamlakah al-Arabiyah al-Saudiyah : bibliyujirafiya, al-Tabah 1. PL245.E231 L4331 EDG 2010 Ref. Les : toplu oykuler (1953 – 2002), 1 baski. PL248.I777 M85 ISI 2010 Ref. Ismet Ozel’in poetikasi : siir Okuma Kilavuzu, 1. basim. PL248.T44 Z5 SUS 2010 Ref. Yangin Yillari’ndan Nida’ya Ahmet Telli siiri, 1. basim. PL248.Y248 G4914 YAL 2010 Ref. This entry was posted in Islamic Collection, Jewish Studies Collection, Library of Congress Collection, Minor Collections, New Accessions on 9 March 2011 by . Here’s the new accessions list. These books are all on our New Books Display in the library. This entry was posted in Islamic Collection, Jewish Studies Collection, Library of Congress Collection, Minor Collections, New Accessions on 5 January 2011 by . Uzuf talabat Jamiat al-Kuwayt an al-takhassus fi al-lughah al-Arabiyah : asbabuh, wa-inikas dhalika ala ihtiyajat al-mujtama, al-Tabah 1. This entry was posted in Islamic Collection, Jewish Studies Collection, Library of Congress Collection, Minor Collections, New Accessions on 1 December 2010 by . The Middle East, 12th ed. Taghridat al-bajaah : riwayah, al-Tabah 7. This entry was posted in Islamic Collection, Jewish Studies Collection, Library of Congress Collection, Minor Collections, New Accessions, South Asian Collection on 3 November 2010 by . Studies in Syriac spirituality, Rev., enl. and updated ed. The Syriac Book of steps : Syriac text and English translation, 1st Gorgias Press ed. Osetiny : istoriko-etnograficheskoe issledovanie, Izd. 2-e, ispr. Leonti Mroveli, Bishop of Ruisi, 11th cent. PK9201.U34 V6 VOG 1963 Fol. This entry was posted in Islamic Collection, Japan/Korea Collection, Jewish Studies Collection, Library of Congress Collection, Minor Collections, New Accessions, South Asian Collection on 14 September 2010 by .